Our maximum shipping is £7 and all orders over £60 go FREE! Hello and welcome to the Brew Barn, home brewing supplies. 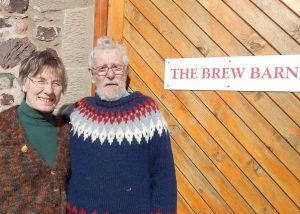 We are a family-run business with 35 years of home-brewing experience. We supply everything you need to make quality home brewed beer and wine at competitive prices, and pride ourselves on offering a personal service to all our customers. We offer all the leading brands of beer kits such as Festival, Bulldog Brews, Geordie, Cooper’s, Milestone, Munton’s and Woodforde’s as well as wine and beer starter kits which include ingredients and equipment. We also supply a huge variety of wine kits including Beaverdale, Cantina and Solomon Grundy. We sell all the equipment you will need for brewing, such as pressure barrels, fermenting bins, bottles, airlocks etc, as well as everything needed to make drinks such as wines and cordials from fruits and other fresh produce. We also stock a range of specialist books. Our electric fruit crusher and manual press, available for daily hire, are proving extremely popular, especially in the autumn when they are used by many people to press fruit such as apples for juice or cider. Please see photos and hire charges under Fruit Crusher and Press Hire. We are the only homebrew supplier between Edinburgh and Whitley Bay and believe the loyalty of our customers is largely due to the special touches we provide. All of our customers get the benefit of face to face chats and advice – something which simply cannot be supplied by an online warehouse. We also offer aftercare and support. We are open from 9.30am-1pm Monday, Tuesday, Thursday & Friday, and 10.30am-4pm on Saturday (please note we are now closed on Wednesdays). As we live on the premises, we are glad to see visitors at any time, but please call ahead to check we are in. Why not come and see what we have to offer – or phone for a chat on 018907 71794. For all your home brewing supplies please also visit our online store. We are now able to take debit and credit card payments in the shop.